Background: Mycobacteria genus is responsible for deadly diseases like tuberculosis and leprosy. Cell wall of bacteria belonging to this genus is unique in many ways. It plays a major role in the pathogenesis and intracellular survival inside the host. In intracellular pathogens, their cell wall acts as molecular shield and interacts with host cell milieu to modulate host defense responses. 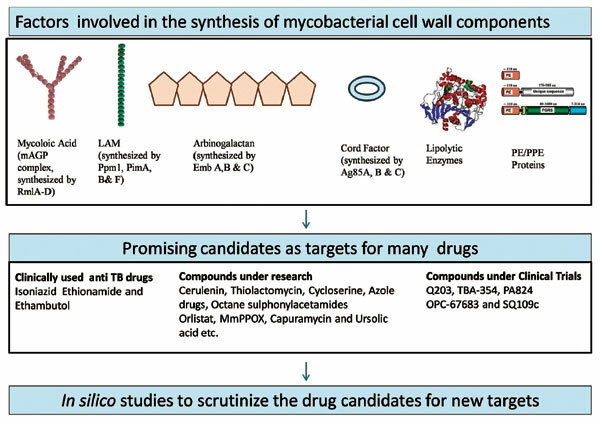 Objectives: In this review, we summarize the factors that participate in the biosynthesis of unique mycobacterial cell wall, understand their potential as drug targets and the recent developments where they have been evaluated as possible drug targets. Results: Several cell wall associated factors that play crucial roles in the synthesis of cell wall components like Antigen 85 complex, Glycosyltransferases (GTs), LM (lipomannan) and LAM (lipoarabinomannan), mAGP Complex, lipolytic enzyme have been categorically documented. Most of the presently used anti TB regimens interrupted cell wall synthesis, but the emergence of drug resistant strains made it mandatory to identify new drug targets. Novel drug candidates which could inhibit the synthesis of cell wall components have been thoroughly studied worldwide. Conclusion: Studies demonstrated that the cell wall components are unique in terms of their contribution in mycobacterium pathogenesis. Targeting these can hamper the growth of M. tuberculosis. In this study, we scrutinize the drugs under trials and the potential candidates screened through in silico findings. Keywords: Cell wall, pathogenesis, anti TB regimens, Mycobacterium tuberculosis, drug design, drug discovery. Keywords:Cell wall, pathogenesis, anti TB regimens, Mycobacterium tuberculosis, drug design, drug discovery. Abstract:Background: Mycobacteria genus is responsible for deadly diseases like tuberculosis and leprosy. Cell wall of bacteria belonging to this genus is unique in many ways. It plays a major role in the pathogenesis and intracellular survival inside the host. In intracellular pathogens, their cell wall acts as molecular shield and interacts with host cell milieu to modulate host defense responses.